I stumbled across this dish looking for something different to cook. I dated this beautiful girl in high school from Trinidad. Once while visiting, her mother cooked this wonderful curry dish and I think it might have been the first time I ever tasted curry. As I was reading this recipe it really reminded me of that dish i had so long ago. Of course, I have added my own adjustments to the original but I think it is a lovely dish that feeds about 6 or so people. 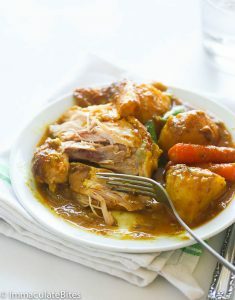 Wash chicken, cut up chicken (bone-in skin on) to approximately the same size pieces to allow them to cook evenly and remove any visible fat that might make the curry oily. Mix 1 tsp pf curry powder and Tajin with brown sugar, salt and pepper. Coat chicken with key lime juice and sprinkle all sides with curry powder mixture. Set chicken aside for at least 15 minutes. In a large skillet on medium heat heat oil until shimmering,. Add chicken pieces to brown (~4-5 minutes) turn until chicken is browned all sides. Remove chicken and set aside. Drain except for approximately 2 Tbs of liquid. Stir in onions, garlic, thyme, paprika and 2 Tbs of curry powder, cook for about 5 minutes before adding the scotch bonnet pepper. Add chicken pieces and potatoes to slow cooker and spoon cooked onion-coconut milk mixture over the chicken. Set slow cooker to high and cook for 2 1/4 hours. Add carrots and beans to crock pot and cook for ~ 45 minutes more or until both vegetables and chicken are ready.